Weekend Facelift (also called Ultra Mini Facelift) is a type of facial rejuvenation procedure which less invasive than the Mini Facelift but delivers far superior and longer lasting results than any non-surgical Threadlifting is able to achieve. 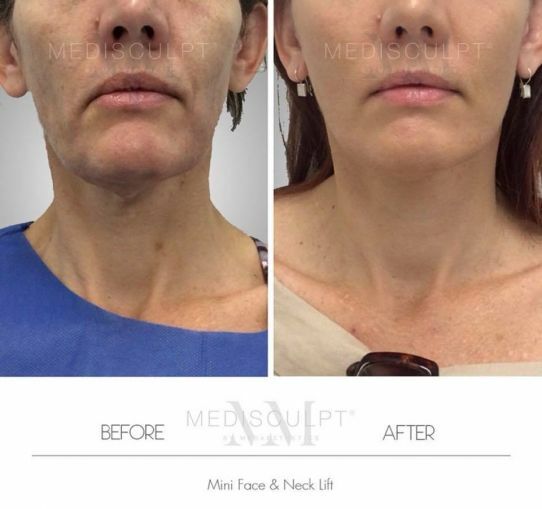 Dr Jadoon routinely offers this procedure to carefully selected patients who have started noticing facial sagging and volume loss in their late thirties and early forties. Weekend Facelift is performed as a day procedure under local anaesthesia only. Patients do not require any hospitalization. The procedure is performed in under sixty minutes in most cases. Once the excess skin which requires removal is marked, a small amount very high strength topical anesthetic cream is applied to the skin. Once the area is numb, a small amount of local anesthetic solution is injected using botox-like very fine needles. Once fully anesthetised, the excess skin is excised using radio-wave surgery device. Patients are awake but are not able to feel any pain or discomfort. There is a minimal amount of bleeding associated as we are not manipulating large areas of facial skin. How long is the recovery after this procedure? As the name suggests, the physical downtime associated with this procedure is less than 72 hours. Most patients are able to go back to work and perform light physical activities within 48 hours. Social downtime associated with this surgery about 5 to 7 days. The Weekend facelift is safer than any other form of face lifting procedure including thread lift. Like any skin surgery, the risk of infection and delayed wound healing can be managed by using prophylactic antibiotics. There is minimal scarring associated with this procedure and is well hidden in the natural crease in front of the ears. Pricing starts from $5500 (all inclusive).